Things are upside down at a South Florida jail where it was corrections guards who allegedly threw punches, and not the inmates. 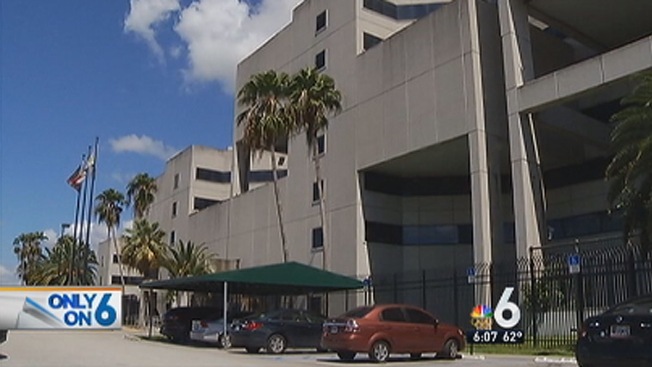 One female guard was apparently injured Sunday when she got caught up in a brawl between men who are supposed to stop the violence at Miami-Dade Corrections, internal reports obtained by NBC 6 show. The reports from the Turner Guilford Knight Correctional Center indicate that an officer got angry when he was asked to replace a meal on one of the inmate's trays. That’s when the fight started between the officers. When investigators needed help sorting it out, they turned to a man in custody on an attempted murder charge and one charged with racketeering, the reports said. The revelation comes on the last day of the job for Miami-Dade Corrections Director Timothy Ryan, who many people blamed for the jail system’s troubles. Emanuel Rhymes is one inmate corrections bosses are turning to about what happened this week during the lunch hour at the TGK jail complex. Rhymes, who faces a racketeering charge, and Christopher Tapper, who is charged with attempted murder, were helping out with meals when an officer with the initials R.W. became angry over changing a food item, the reports show. According to the female guard, Officer R.W. asked for a special diet tray, and she told him that a sandwich was needed to replace the diet tray. Officer R.W. said he was not going to replace anything, and Rhymes gave the tray to an officer with the initials K.A. in a booth. "Officer [R.W.] approached inmate Rhymes, pushed him and told him to pack his sh--!” the female corrections officer wrote in a report. Officer R.W. then went to where she was standing and told her to get out of the way – using another expletive – in a loud, aggressive voice, she said. “He then placed both hands on my shoulders with full force (and) pushed me to the side of the booth on to the bookshelf, and began to engage into a physical altercation with Officer [K.A. ],” the female officer, who has indicated she was injured, told supervisors. Another male officer rushed in to separate the corrections officers battling in front of the inmates. The internal reports indicate that a supervisor believed that Officer R.W. may have been at work under the influence of alcohol. The two inmates who witnessed the incident are on the right side of the law this time, and are helping the department get to the bottom of what happened, the reports show. The fisticuffs between guards come at a facility already under close supervision by the U.S. Department of Justice, which is investigating whether inmates’ rights were violated in other cases. John Rivera, the head of the Dade County Police Benevolent Association, represents the guards. “And the feds did come in and they gave a very scathing report. I think very little has been done to repair those ills that were reported by the feds,” Rivera said of the county’s jails overall. “We welcome the feds. We’d love to work hand in hand with the feds here because the folks downtown are not paying attention." With Friday Ryan's last day, Rivera said Miami-Dade Mayor Carlos Gimenez has to take the bull by the horns. "That's going to be downtown, that’s going to be the mayor and whether he's going to put priority into public safety and so far he has not," Rivera said. "I have plenty of leadership skills and I probably could teach him a thing or two about leadership,” Gimenez told NBC 6, adding, “My job is to make sure that I pick the right director and the director who will lead us into the future, that will make the changes that are necessary in that department." Assistant Corrections Director Marydell Guevara has been named to take over on an interim basis. The mayor said that even though some civic groups were calling for Ryan to leave a long time ago he did make strides in making the jails better and satisfying some of what the feds are trying to do. Even the feds give Ryan high marks for transparency in his operation.